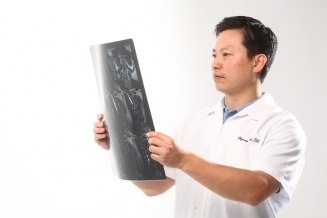 Hi, I'm Dr. Hyung Pak, founder of Chiropractic Plus, and I help people get rid of neck and back pain as quickly as possible. After spending the last 12 years helping people with neck and back pain, I've learned people tend to lose hope and become desperate when in pain. But, I want you to know that I'm here to help. Trust, that I will spend the time necessary to diagnose your condition accurately and ultimately have you leave my office feeling better than you came in. I'm not sure what happened, but I woke up with pain 3 days ago and it's not getting better. I probably need to see a doctor, but I don't like to take medication and chiropractic scares me. I know it's not normal to have back pain at my age, but I don't know what to do. I can hardly work due to my neck and back pain. I didn't know Sports or Auto Accidents can cause so much pain. Nothing has helped, I'm thinking of Chiropractic as my last resort. If so, there is a good chance you're having “mechanical” spinal problems that's causing "functional" issues leading to neck or back pain. Because the above conditions can cause: ligaments to overstretch, muscles to tense, increase disc pressure, and increase swelling/inflammation. This will more than likely result in pain. So, if your pain lingers or worsening, our office is a great place to start. To know if we can help you, please take the short survey below. If you answer "Yes" to at least 4 of the questions below, there's a great chance that we'll be able to help you. 1. Are there periods in the day when you have no pain? Even 10 minutes? 2. Is the pain confined to areas above the knee? 3. Are you generally worse when sitting for prolonged periods or upon rising from the sitting position? 4. Are you generally worse during or right after prolonged bending or stooping as in bed-making, vacuuming, ironing, washing dishes, or gardening? 5. Are you generally worse when getting up in the morning, but improve after about half an hour? 6. Are you generally worse when inactive and better when on the move? 7. Are you generally better when walking? 9. Have you had several episodes of lower back pain over the past months or years? 10. Are you able to move fully in all directions without pain between episodes? 11. Are you pain-free between episodes? 12. If you have pain in the buttocks or upper/lower leg, does it sometimes stop completely, even though you may still have back pain? 2. Are you generally worse when sitting for prolonged periods or on rising from the sitting position? 3. Are you generally worse when inactive and better when on the move? 4. Do you sometimes experience pain across the shoulders or into the shoulder blades? 5. Do you sometimes experience pain down the arm and into the hand with symptoms like the feeling of “pins and needles” or numbness in the fingers? 6. Do you have periodic headaches? 7. Have you had several episodes of neck pain over the past months or years? 8. Are you able to move your head fully in all directions without pain between episodes? 9. Are you pain-free between episodes? 10. If you have pain in the scapula, or upper/lower arm, does it sometimes stop completely, even though you may still have pain in the neck? Chiropractic is no longer about only aligning your neck and back. Matter of fact, Harvard Medical School, concluded that chiropractic spinal manipulation combined with muscle therapies, posture exercises, and ergonomic training may be helpful for back pain, migraine, neck pain, and whiplash. Chiropractic has become more mainstream as Medical Doctors and Chiropractors often make referrals to one another. Additionally, I'm certified in the latest evidence based therapies which include Active Release, Graston, Mckenzie Method, and Kinesio Taping. These treatments are commonly used by professional athletes which helps to reduce pain, improve muscle flexibility and strength. We don't use a cookie cutter approach to treat every neck and back condition. We'll put together a plan based on your need and condition. Our goal for you would be to seek long lasting pain relief without just merely masking the pain. The sooner you seek treatment, the faster you can begin to heal and recover. You can schedule today and we even provide treatment to help bring immediate relief during your very 1st visit. So call us today at 678-610-7587 to make your appointment! We have representatives standing by 24/7 to take your call. "I was apprehensive at first, but I was very desperate. I attended a boot camp class that left me in excruciating pain. The pain was predominately in my lower back...As a result of the treatments, I got my value of life back." "In just four visits I was feeling a lot better, the pain level went from a 8-9 to a 2-3. I am able to get away from prescription pain meds and enjoy doing things with my kids...my neurosurgeon game me Dr. Pak's information, he came highly recommended. I figured if my neurosurgeon is recommending a chiropractor then I should go. I'm sorry I waited this long and Dr Pak has my vote." Our office is easy to find. We are conveniently located near Jonesboro, Riverdale, Stockbridge, Morrow, Ellenwood, Forest Park, and Rex. If you have any trouble finding us, Call (678) 610-7587 and we'll help you get here.